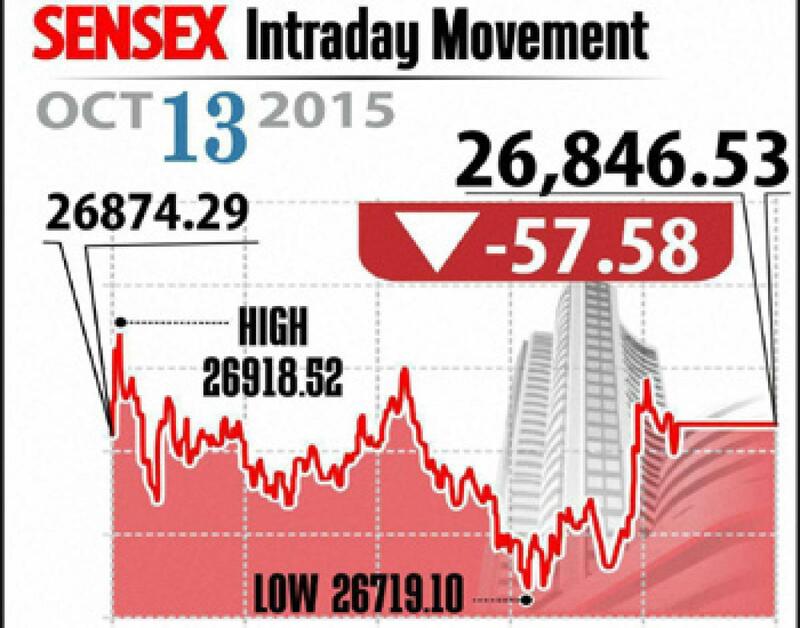 Mkts tumble over global cues. The benchmarking indices close lower for the second straight day due to profit taking with metal and IT shares led the fall on Tuesday. Mumbai: The benchmarking indices close lower for the second straight day due to profit taking with metal and IT shares led the fall on Tuesday. Also global cues further influenced the investor sentiment. Despite strong IIP numbers coupled with the rising CPI inflation, the investors decided to take profits on those shares which gained handsome in the previous sessions. Sensex closed down 57.58 points at 26,846, Nifty fell 11.90 points at 8,131. Meanwhile, roader markets outperformed the benchmarkings with midcap index closed flat but smallcap index closed up by 0.4 per cent. On the sectoral front, the IT and Oil and Gas indices fell by 1 per cent while other sectors like healthcare, banks, capital goods, consumer durables and auto declined marginally. However, realty index gained over 1 per cent. While ONGC topped the selling list by losing 3.5 per cent, Tata Steel, Vedanta and Hindalco down up to 3 per cent each. On the other hand, ITC, Maruti Suzuki, Bajaj Auto, Coal India and BHEL gained between 1 and 1.8 per cent. IT stocks continued to reel under pressure for the second day with TCS down 0.3 per cent, Infosys down 3 per cent and HCL Tech donw 3 per cent. The gainers: Coal India, up 1.79 per cent at Rs 340.50; Bajaj Auto, up 1.46 per cent at Rs 2,460.75; BHEL, up 1.39 per cent at Rs 208.45; Maruti Suzuki, up 1.02 per cent at Rs 4,275.35; and ITC, up 0.98 per cent at Rs 344.05. The losers: ONGC down 3.49 per cent at Rs 254.25; Hindalco, down 2.99 per cent at Rs 86; Vedanta, down 2.80 per cent at Rs 107.75; Tata Steel, down 2.37 per cent at Rs 245.20; and Infosys, down 2.12 per cent at Rs 1,098.65.